Here’s how to put the brakes on booze to lose lbs. Are your nights and weekends filled with social or business commitments like client dinners, a date, Saturday night with friends followed by a Sunday brunch? What do all these events have in common? Alcohol! You may be careful with what you eat and try to exercise on a regular basis but sneaky liquid calories can pack on the pounds. Here’s some tips on how to put the brakes on booze without ruining your social life. Living in NYC, I know firsthand that socializing frequently includes alcohol in some form. A major part of my job as a nutritionist is to listen to what people tell me they eat and drink. Now I’m certainly not saying everyone drinks, however the majority of my NYC clients spend several nights a week out and alcohol is frequently involved. So I’ve come up with a list of common problem situations my clients (and myself!) may encounter with regards to alcohol. In addition, I’ve included the thoughts that may be running through your head. Business dinners. You might feel somewhat obligated to have one or more drinks, depending on what direction the group is going in. You don’t want to stand out. Dates. More often than not, you’ll meet your date for a drink. This may be especially true for first dates, as a little alcohol tends to take the edge off. Meeting friends for drinks after work. Guess this says it all! Sharing a bottle of wine at a nice restaurant. Your significant other has their heart set on that Bordeaux. You don’t want to be a killjoy and order by the glass. Dinner parties. The wine is flowing and you don’t want to insult the host. Summer BBQ’s. Everyone else is drinking Corona’s with lime … they look so refreshing. Vacations. Chilling out often means eating and drinking. You’ve been working so hard you deserve it. Alcohol in moderation has health benefits, including decreasing risk of heart disease. However the key word is moderation! This means one drink a day for women and two a day for men. 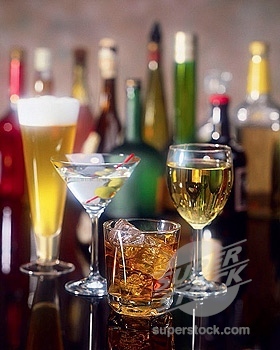 Keep in mind that a martini or jumbo glass of wine served is not “one” drink. 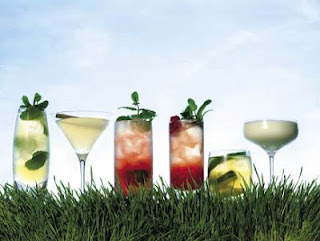 A serving of alcohol is equal to a 5 ounce glass of wine, a 12 ounce beer or 1 ½ ounces of hard liquor. Wine contains 25 calories per ounce and hard liquor contains 70 calories per ounce. Therefore a typical 5 ounce glass of wine is 125 calories and a mixed drink with a non-caloric mixer (i.e. vodka and soda) has 105 calories. Now back to those jumbo drinks … I’ve seen an 8 ounce martini at a NYC steakhouse (this equals 5 drinks or 560 calories) and an 8 glass of wine (this equals 1 1/2 drinks or 200 calories). You’d have to spend a lot of time on the treadmill to burn that off! 1. Instead of always meeting friends for drinks after work, make plans to take a Zumba class or go for a speed walk. You can then grab a healthy dinner afterwards – without the alcohol. 2. Drink slowly. No one will even notice. Sounds simple, but it works. The slower you drink, the less alcohol you’ll consume. 3. Set limits on how many drinks you will allow yourself a week. Perhaps your goal is five. That means if you want to indulge with your Match.com date and have a few beers at the BBQ, then no drinks with your girlfriends at dinner on Friday night. 4. When meeting friends for drinks/dinner, try to arrive a little late. This way you can skip the martini at the bar before dinner. 5. Meet dates and friends for coffee instead of drinks. 6. Drink a S—-L–O—-W drink. For example, I tend to drink red wine more slowly than white wine. If I wanted to drink REALLY slowly, I would order a scotch. 7. Business dinners can be troublesome. As soon as you turn your head, the waiter is ready to fill your glass. Remain on high alert and subtly cover your glass so it doesn’t get refilled. Drink slow and drink a lot of water. 8. Try to schedule more business meetings over lunch instead of dinner. Not too many people drink at lunch these days. 9. Alternate your glass of wine or drink with a club soda. 10. Visualize the scenario before heading out to meet your friends. Set your goal as to how many drinks you will have before going out. Stay focused throughout the night. I’m not against drinking alcohol as I happen to love wine! However, I find that alcohol is a culprit for many of my clients struggling with their weight – whether they want to lose 5 pounds or 50. So try some of my tips and let us know if they help. *Please keep in mind that there is fairly consistent evidence that alcohol increases risk of breast cancer. So if you are at high risk for breast cancer, talk to you health care professional. This post is written by NYC-based registered dietitian Martha McKittrick, R.D., C.D.E. For more great nutrition, fitness and diet tips and information, be sure to check out Martha’s blog, CityGirlBites.